Months ago my friend Reid shared a link with me over Facebook Messenger to an album they had done. I put it on a backburner, "I'll listen to that soon." Well, here I am at the end of the year, and I have finally listened to this tape, Carrie Blast Furnishings. I think that you should too. The cover art is pretty simple. I don't feel much about it. I like the crookedness of the design, and I like the old-timey look connecting it with the Carrie Blast Furnaces referenced by the title. I wish it wasn't just all white though. It's not a design I particularly love. 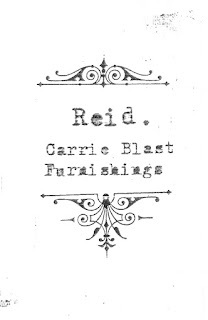 &amp;amp;lt;a href="http://unreadrecords.bandcamp.com/album/unread-234"&amp;amp;gt;unread #234 by Reid.&amp;amp;lt;/a&amp;amp;gt; The first song on Carrie Blast Furnishings is “Dry Mouth Dawn”, a song that goes through small changes before heading into a more traditional form of lyrical folk acoustic guitar works. 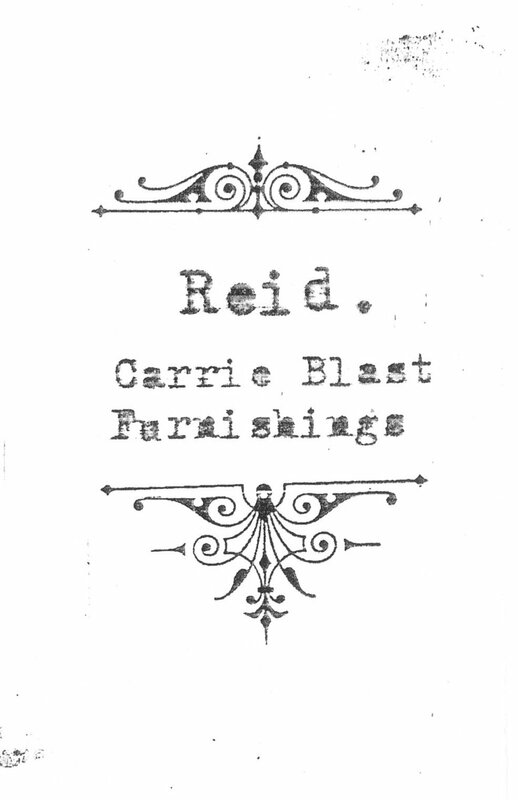 Reid’s lyrics are introspective and sad, an elegy to weedy evasion on the edge of the waking world, red-eyes separation. The turn at the end suggests the narrator inviting another into the shadowy edges before a tape drone whirrs out the track. Next is “The Archive (Infinite Turns)”, a more sedate work, an empty wooden floor with some small particles that haven’t been swept. “The sun becomes the moon; you think you’re in a stranger’s room”. The song made me happy towards the end. “Letter G” is a kind of a rock song played by brave couch surfers who can rock and even roll. It sounds like The Soft Boys, and it is good. I like it. “I try to make my love like the letter ‘G’.” Is there better than that? “Sisters of Fountain” hisses and croaks and scuffs, a toy in a wind-up factory. “And I drove down to the bog, trudged uphill and mountain, just to get a cool, clean drink from the sisters of the fountain. Oh yeahhhhhhh…” It’s a country song, more so than the others. The song sounds like an excellent metaphor for an abusive situation to me. I’m not sure if the sisters are good or bad though. The ambiance at the end is quite cool. “Swissvale Samba” opens with the strangest combination of old-school cheap keyboard drumbeat and Legend-esque synth pads. Then a guitar, or maybe a ukulele, plays with the little drums, and it sounds good, recalling the gentleness of Jonathan Richman. It does go on a bit long. Some spaghetti western synths close it out. Side two, I think, begins with “Sophia”. Since I don’t have a physical tape, I’m just guessing. It starts with another micro-synthphony masterpiece. “Sophia” and the narrator are falling apart; the beautiful poetry sounds like Bob Dylan in certain turns of words and cracks in vocals. “Spider has made its home by the outlet,” Reid says before going in to “Comforter”. These last two songs have both been preceded by VHS tape static effects. “Comforter” is high drama Led-Zeppelin as a slower and more deliberate tunehouse blues with pop hookage fishing line. “When I feel a solid metric ton way down on my mattress on the floor,” Reid says, and I hear high art of true authentic colors. The sound is so full for just acoustic guitar and vocals. “Salinger Christhead” comes right in from “Comforter” with a lustful rhyme that goes on and on. "Enough with all this neoliberal capitalism. Jump into my bed, and untie my red ribbon 'cause I do so much better when I'm loved and I'm fed." I love "Space Whales", the next track. "I have no fear. They'll meet me here, way out in the Midwest." It's a little cleaner than the others and very cinematic. "Screaming Trains" was recorded at a different location than the other tracks. I don't know that that is obvious from the track itself, but it does seem a little quieter and more subdued than most of the rest of the album. The chorus, the title repeated, is really great. "Sometimes I stand in my own backyard just to stare at another, and it's about time to cut that out." The last track, "Reel of Lies" has a semi-Celtic, or maybe bluegrass, kind of thing mixed with a weird, whirring drone. This is another favorite on this album. Carrie Blast Furnishings is such a great album. I love the little VHS-synth snippets. I don't know if they are samples or original, but they sound great mixed in with the ragged and real music, a glimpse into a different time and space of misty heights and spacious waters. The lyrics set the craft into motion. Carrie Blast Furnishings receives a Good. You can order Carrie Blast Furnishings from Unread Records here on from the Bandcamp above.